THE TRUTH, THE WHOLE TRUTH, AND NOTHING BUT THE TRUTH SO HELP ME GOD, AS GREAT WRITER FREDDIE LEE SIRMANS SENIOR SEES IT. Unless drastic changes are made this writer believes the USA and world economy is past the stage of no return of collapsing all the way back to the Stone Age. I base this on the destruction of the nuclear and extended family foundation and the come about of minimum wage laws in the USA and Western Europe. Economics entered a dangerous new frontier in the USA with the enacting of the 1938 socialist federal government's minimum wage law, which has since proven to be a totally disaster. Back when the rotating bust cycle purges occurred around every seven year there was no real panic, because that kept the nuclear and extended family strong and healthy. The very young were taught proper norms and traditions and anti-survival forces like liberalism couldn't get too powerful. Even as late as the 1950's very few individual citizens depended on the federal government for anything, whereas today almost everybody and his brother is dependent on the feds one way or another. I believe that minimum wage law took a strong USA economy that had just completed a far too long delayed and too large rebirth bust cycle, but with good intentions neutered it into the lack of societal discipline weak p…. economy that we still have today. 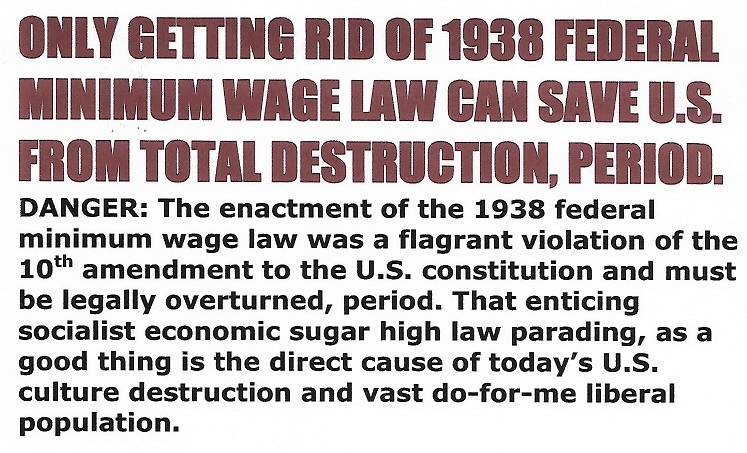 Ever since that act which was a poison pill, the minimum wage law begins blocking the USA economy’s ability to fully purge; thereby rending the USA economy we have today powerless to maintain societal discipline. With no strong societal discipline, then all negative anti-survival forces with no counter balance begin growing unchecked, including liberalism. And to make matters even worse, the liberals really flung the flood gates wide open by creating a welfare state. Never in history had the very poor ever been almost totally moral corrupt, but today the very poor is almost totally liberal and killing in the womb and same sexing more than any other demographic group. Even if the 1938 socialist minimum wage law was repealed today all it would do is give the USA a fighting chance of not collapsing all the way back to the Stone Age. But, the fact is nothing else could even give the USA a fighting chance of surviving economically, culturally, or morally against what is going to hit the USA soon. Folks, I am just one man writing my one-man opinion, please pray with me that I am wrong for the sake of mankind. Look at the USA news media today; they are over whelmingly liberal, the same as the education system, whereas a hundred years ago about the only place you could find a true bleeding heart liberal was from a rich family, or maybe on a college campus. The quickest way to destroy any society or civilization is to take away its need to struggle and fight for survival on an individual basis. That is the trick nature plays on mankind. You can never gain the deepest wisdom and insight without struggling and fighting for survival in some way. Whereas, the lack of hardly any struggle or fight for survive breeds multitudes of shallow dependent minded liberals. Down through the ages just day-to-day living demanded strict discipline because the elements and practically everything else was unforgiving. When the welfare state takes away a survival need for man to be head of household that is headed down a narrow dead end street in this writer's view, and is what's really taking down Western Civilization. FREDDIE LEE SIRMANS SENIOR’S LOG: 21 APRIL 2018, 1515 HOURS.